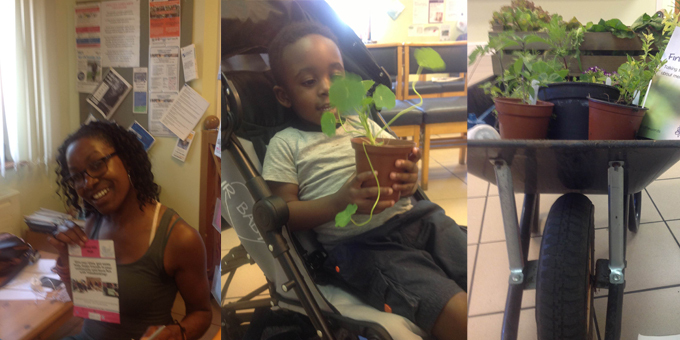 It was a buzzy morning at Herne Hill Road Medical Practice on Wednesday as part of National Carers’ Week. Loughborough Farm’s Wish You Were Here project was selling salad leaves and plants, encouraging people to get involved at the farm and the Community Cafe. Meanwhile Funmi Olowi was running a knitting session linking up with people to talk about Time Bank. There were some great conversations and we had a lovely talk with an 11-year-old young carer (who has a significant language disorder) who had popped in from another surgery. He and two of his brothers care for their mum who has severe arthritis in her spine. He said he rubs his mum’s arm to comfort her. His other nine-year-old brother has sickle cell disease. His mum was really proud of her boys and says caring gives them a great lead in life. Thanks to the surgery staff.